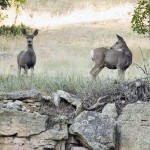 Many times we fail to realize that our ears are just as critical a tool for finding deer as our eyes are. While I was in the tree stand (see Days 1 and 2), I tried to distinguish between each sound. 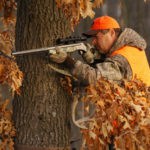 An efficient hunter must be able to tell the difference between a woods bird rustling in the leaves, a squirrel hopping from spot to spot, and a deer, a turkey or a man walking. Many times when a squirrel barks, a deer may be disturbing him. So, as the hunter’s eyes must be trained to interpret what he sees, so should his ears interpret the sounds he hears. As I listened from my tree stand on that day, I sorted out the sounds I heard. Since my stand was in relatively thick cover, in places I could see less than 20 yards. At other spots, I could see a maximum of 50 yards. I figured I would hear the deer before I spotted him. After I’d just finished blowing the grunt call, I heard something walking toward my stand behind me. Because I was standing on the tree stand rather than sitting, I was able to turn easily and face the sound. I brought my rifle up to the ready position but didn’t aim until I identified the sound. 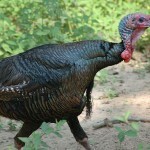 A deer, a turkey and a man all sound alike when they’re walking in the woods. The cautious hunter will hold his shot until he can know what his target is before he aims. Also aiming at a sound limits your vision. Picking the place to take a deer is more critical to your bagging a buck than actually pulling the trigger. If you don’t have a clean shot, or if you shoot too quickly, you’ll more than likely miss. At 50 yards, I could see the body and the outline of a deer. I could tell that the animal had antlers, but how many, how big and how high they were I couldn’t distinguish. 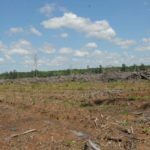 My host on this hunt had his land on a management program and had asked that I not take small, young bucks but rather harvest inferior bucks and trophy bucks. As the buck came closer, I studied his antlers. I also noticed that the deer was walking straight in toward me. He wasn’t feeding or meandering but was looking for something. I think the deer had heard the grunt call and was coming to investigate. When the fat buck was at 20 yards, I watched him through my 4X10 scope. I always put my scope on the lowest power when I was deer hunting, so that I would have the widest field of view and could aim accurately at deer at close range. If I needed to take a deer at long range, I usually had time to increase the power of my scope. Although one side of this buck’s rack had 4 points, on the other side of the rack, the main beam was blunted and only the brow tine stuck up. Apparently this was a genetically-inferior deer that should be culled from the herd as the landowner had requested. 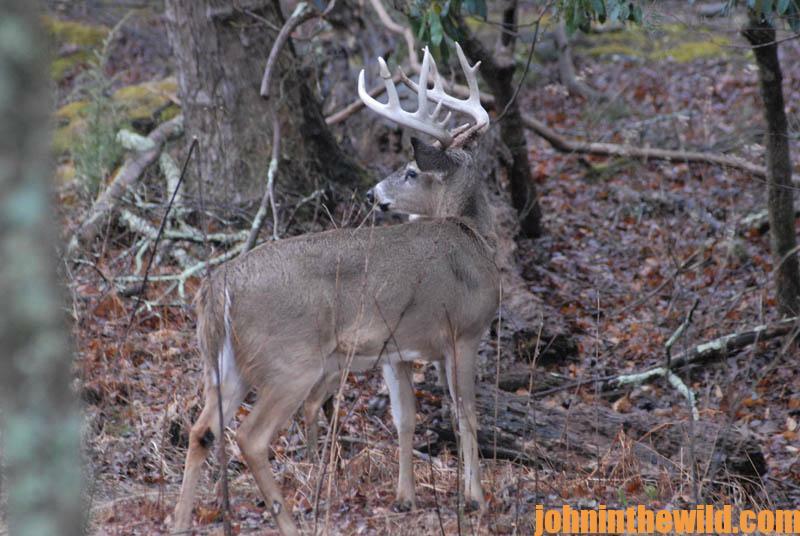 Even though he had a nice 4 point rack on one side, the other side of his antlers was deformed. As the buck continued to come closer to my tree stand, I picked an opening 30 yards from my tree where I assumed the deer would walk. 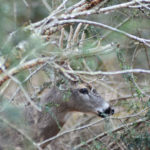 I braced my gun against the side of the tree, aimed for the opening with one eye and kept the other eye open, so I could see the movement of the deer. 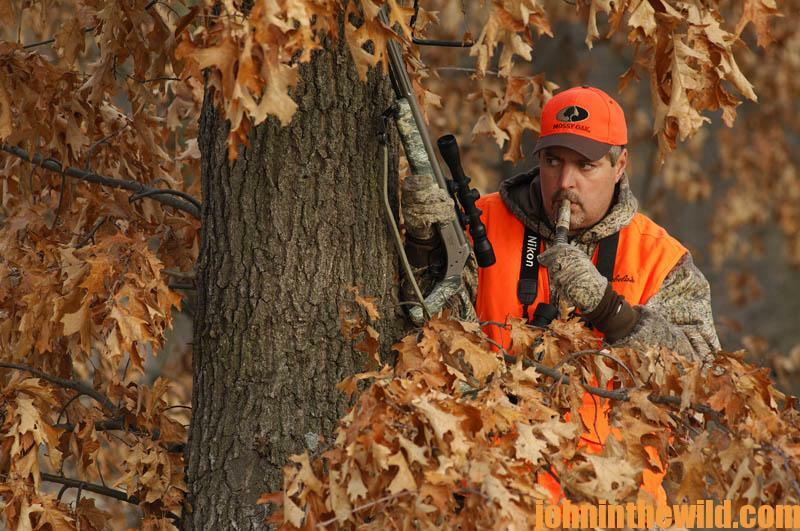 The hunter’s ability to see the deer is critical to his taking the deer. 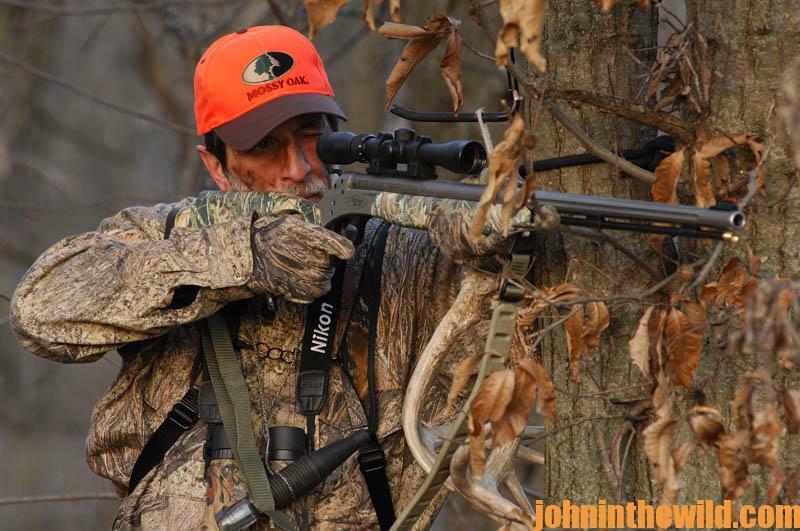 If a sportsman looks into his scope and waits for the deer to appear, he can’t continue to watch the movement of the deer – if the deer veers off course. Therefore, keep on looking at the deer while you’re lining-up your rifle to take the shot. 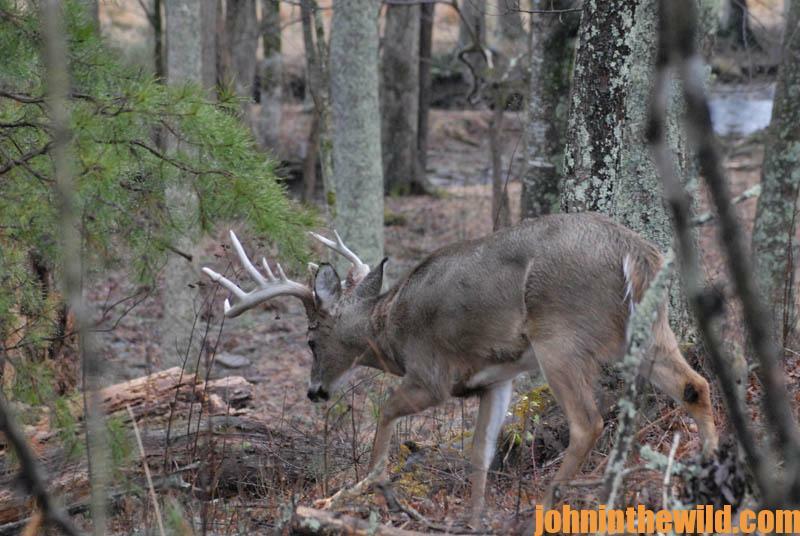 The buck followed the route I had predicted he would take and stepped into the opening. But instead of firing as soon as the deer appeared in my scope, I waited. Although the deer was facing me and presented an easy shot, it was not the best shot. Since I wanted a broader target, I waited for the deer to turn his head slightly and present a better angle.